With the exchange rate of the ruble (the official currency), Russia is now one of the cheapest places to go in Europe and also the one with the best price to quality value. Cheap doesn’t mean bad. Because for the Russian standards it might not be cheap at all. However, in order to travel more, we all have to save on something. Even though in St. Petersburg with 12 euros you can afford a lunch/dinner in a fancy panoramic restaurant, some people don’t see the need for it and would prefer to enjoy very nice meals for 4-5 euros. So, what are the places to eat in St. Petersburg on budget? 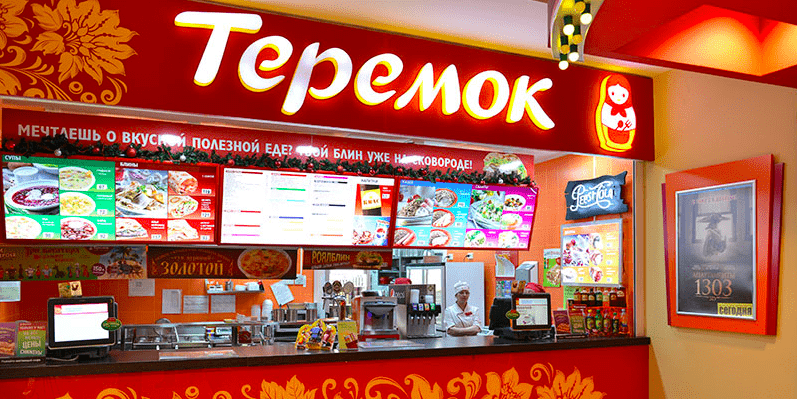 Teremok is a Russian fast food chain, where you can order crepes (blini) with all sorts of fillings. e.g. sour cream, jam, banana and chocolate, feta cheese + bacon + dill, beef and potatoes and many, many more. There are so many different fillings that everyone will for sure find the one that he/she will like. Besides crepes, Teremok offers such traditional Russian dishes as buckwheat with sausage/chicken/egg; dumplings (pelmeni), Russian salad, Russian porridge and so on. Almost everything is really tasty in Teremok! Well, the prices for one crepe vary from 1 to 4 euros (the ones for 4 euros will really make you full), while the rest of dishes is from 1.5 to 3.5 euros. However, Teremok offers 4 lunch deals available all the time during the working hours of the restaurant, which usually include a soup/salad, a crepe of your choice and a drink. The prices for the lunches start from 3 euros and the most expensive one costs 4.5 euros. There are so many of them in the town. However, if you’re in the city centre, try the outlets on Bolshaya Morskaya Street, Nevsky prospect 60 or in the major shopping malls like Galeria and Sennoy. Ever thought of trying traditional Russian pies (pirogi)? Head to Pirogovy Dvorak! That’s one of the best mentioned places to eat in St. Petersburg on budget. It is also a chain and you can find a few outlets in different districts of Saint Petersburg. The most remarkable one, though, in located right in the heart of the city, on the street called Griboyedov Canal Embankment, 22, (very close to Nevsky Prosper metro station) with the awesome view over the Kazan Cathedral. The restaurant offers a variety of very delicious Russian pies, such as, for example, pies with egg and cabbage, potato and mushrooms, black currant and so on. Moreover, during the daytime the restaurant offers a business lunch deal for a very low price. Actually, all the prices in Pirogovy Dvorak are very low: for 8 euros you can at least 2 people really full. When people usually ask about some places to eat in St. Petersburg on budget, most common answer is: Stolovaya 1. Stolovaya Number 1 is a chain of low-cost canteens: it’s both very cheap and centrically located in the city and thus, quite easy to find. The biggest outlet is located right on the Nevsky Prospect (very close from the Hermitage Museum) and it’s always full – means you won’t die from the food there. I am not the biggest fan of this place, but some of people I know totally rave about it! It’s cheap, fast and nicely decorated: yep, it looks more like a restaurant than a canteen. Also, everything you can order is displayed to you behind the show-window, so the only thing you need to do is to point on the dish you like (not that the staff speaks English anyways :D). You can eat there for as low as 3-4 euros per person, and that would include a salad, soup, main dish and a drink (and maybe a dessert, too). This one is really great, though, might seem a bit strange to the tourists. 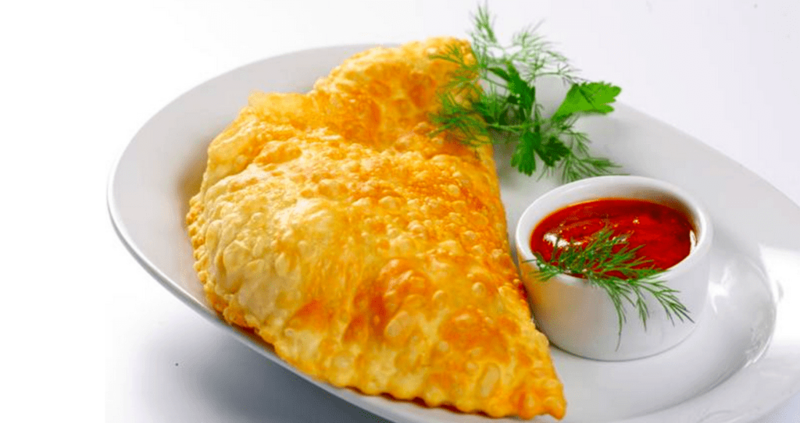 Even though Brynza offers all the traditional Russian dishes, its specialty are chebureks, traditional puffy fried pies with delicious filling inside. You can get one for less than 2 euros and you will probably get full with it. There are plenty of Brynza outlets on the main street of Saint Petersburg, Nevsky Prospect and unlike all the previously mentioned places, Brynza is a not self-service chain: you’ll get seated, you can ask for an English menu (but most of the items in the Russian menu are translated to English anyways) and order a dish of your selection. ObedBufet is definitely not one of the cheapest places to eat in St Petersburg, however, there are some great lifehacks about this place. It is usually open from 9 to 23 and there are happy hours from 10 to 12 in the morning (when you can have almost everything with 30-50% discount) and from 9 to 11 in the evening, when you can buy food only (doesn’t apply to the drinks unfortunately) with 30-50% discount. ObedBufet belongs to the chain of the fanciest restaurants, Ginza Project, however, it’s the first buffet-style restaurant of the group. Without the discount you can eat a soup + main dish + drink for around 8-12 euros. However, during the happy hours you can have a soup, roast beef, side dish and a beer for just 6-7 euros (or even cheaper). Moreover, the food in ObedBufet is quite healthy and the selection of dishes in just huge (more than 150 for sure). There are also plenty of other places offering special lunch offers (where you can have a set of meals for 200-400 rubles (3 to 6 euros), and usually they have this information written on their doors or somewhere else. 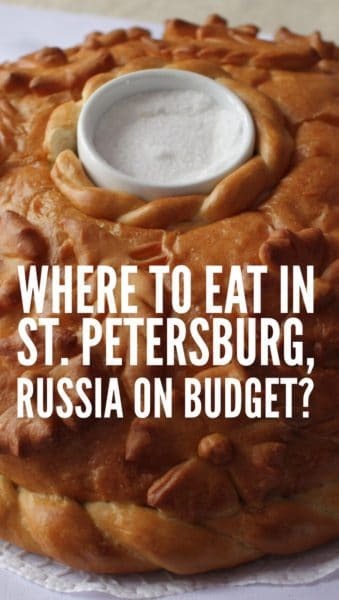 Liked this post about places to eat in St. Petersburg on budget? Share it on Pinterest!